We have eight parks in Newton Aycliffe, all owned and maintained to a high standard by Great Aycliffe Town Council. Each park has its own character, from the modern Town Park to St Oswald’s Park which is more traditional. Modern or traditional, every park has a well equipped play area. 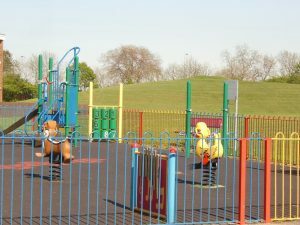 As well as those in our parks, we also have many separate play areas with modern, well equipped and safe play equipment. We also own and maintain nine football pitches which are rented to teams during the football season. We also maintain a Rugby Union Pitch at Moore Lane. Maintenance checks are carried out regularly. However, if you find that the equipment or the play area needs attention please let us know by telephone or e-mail to info@great-aycliffe.gov.uk and we will endeavour to carry out repairs or make the area safe as soon as we possibly can.